I've been to here twice, one experience good and one was a little sloppy. Both visits were in large groups, 20+ people, which is a challenge for any busy restaurant. The décor is very Milestones, stylish and modern, with ample seating, indoors and out, for any size group. My first visit was on their beautiful patio. The service was great and their summer drinks were fantastic. If you put fruit, iced tea and booze in a glass, I'm damn well gonna drink it....and I did. A delicious creation! The service and food were great. We're a pretty easy going gang and the server matched our easy going nature.....even when she walked in on ridiculous conversations. We all got a good laugh out of it. 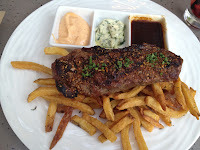 I enjoyed the Steak Frites on the patio. The steak was very tender and not overdone or over seasoned. The fries were pretty good too. I didn't realize 3 sauces came with it. They were all delicious; I dipped the fries and steak in them. Peppercorn sauce, herb butter and chipotle aioli. 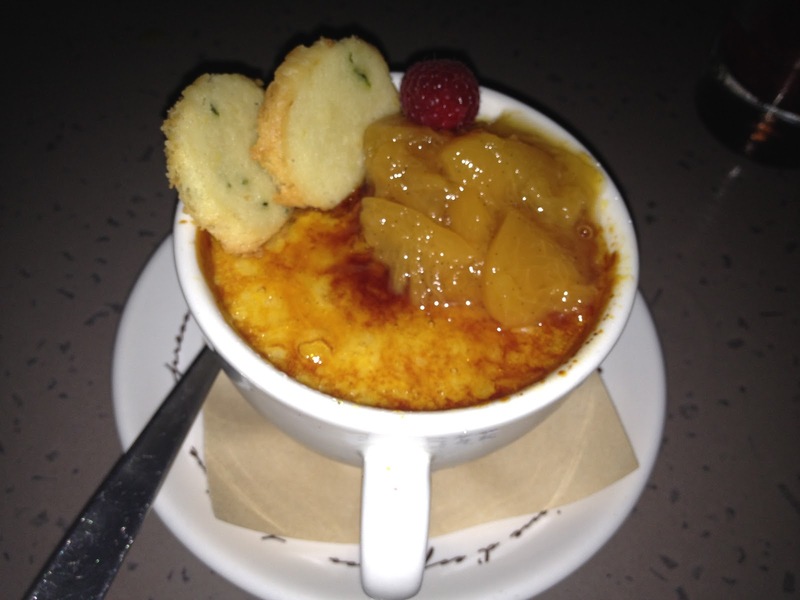 Dessert consisted of.....you guessed it...creme brulee. It was pretty good, not the best I've had but good. The almond biscotti was complimentary to the vanilla custard. I hear the cheesecake lollipops are fantastic! The second visit was in the bar area. More people came than expected and our table wasn't big enough, some people stood. It was a casual evening, so no one complained. We stole some chairs from a nearby table. I had the stuffed chicken. You now must have it. It was AMAZING. 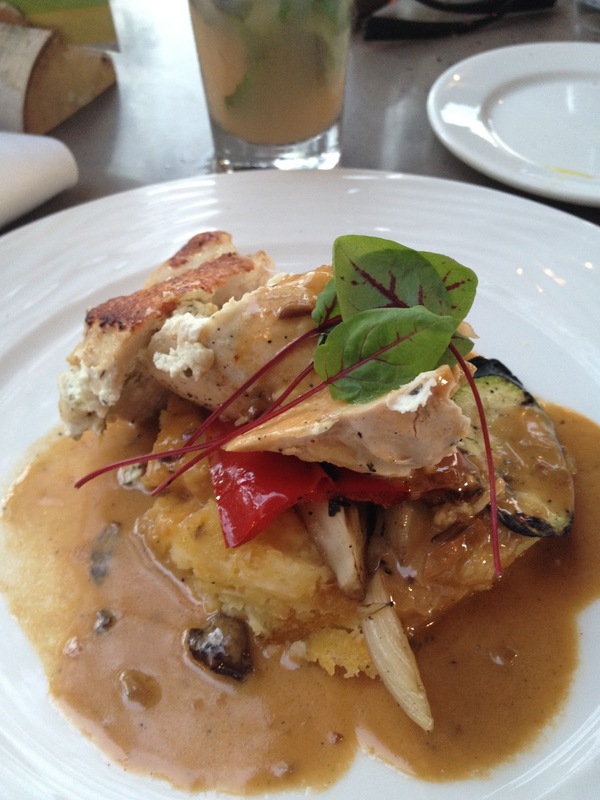 Stuffed with local goat cheese and topped with wild mushroom cream. The chicken was so moist and tender, it made you want more. It was so good, in fact, I've completely forgotten if I enjoyed the accompanying mashed potatoes and vegetables. My issue came at the end of the meal. I've had this issue before. I needed my bill. I asked 3 times for my bill. No bill. Others started getting antsy and asked again. No bills. We waited for easily 20 minutes. I was not happy. We had 2-3 servers and not all the orders were taken at the same time. Being on call, when I need my bill, I need it NOW. However, they didn't charge us for 1 of our drinks. That was nice of them! I would absolutely go back. 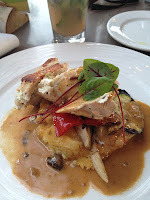 The food was fantastic and the service was great....with the exception of the bills! Yet another masterpiece from the Charcoal Group!